Layaway Make a 25% deposit, then three more monthly payments of 25%. Wrap ships when paid in full. SKU: N/A. 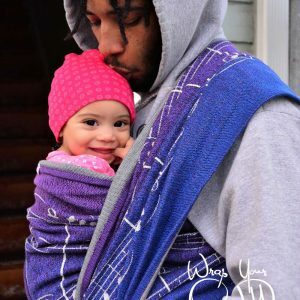 Categories: 100% Cotton, Blue Wraps, Featured Products, Irregular Designs, New Wrap Designs, Search by Design Style, Search Wraps by Fabric Content, Smitten Wraps, White & Natural Wraps, Woven wraps for Dads, Wraps by Brand. Smitten with Woven’s Nimh design is inspired by the characters in The Secret of Nimh. This Smitten Nimh Justin wrap depicts beautiful white birds flying over a gradation of blue and ecru. This blue gradation gives the wrap the feel of a beautiful day with fluffy white clouds. 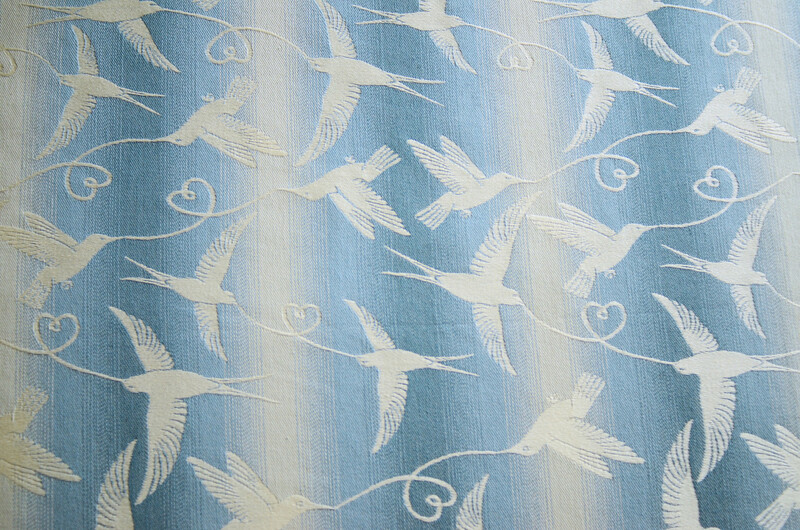 The white line of each bird extends from a graceful scissortail to a white heart extending from the beak and connecting each bird to another. It’s truly a beautiful effect. 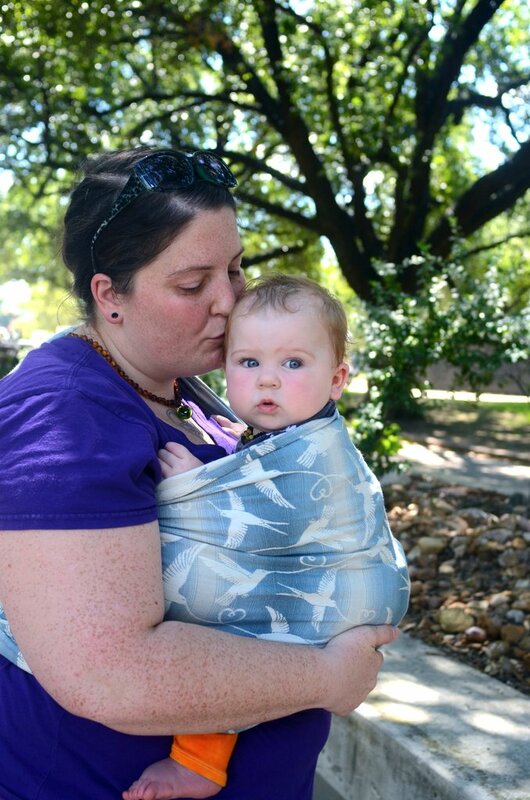 Smitten Nimh Justin is a cuddly soft cotton wrap that is medium weight. The wrap has a medium amount of texture. It wraps beautiful and is very moldable and easy to work with. 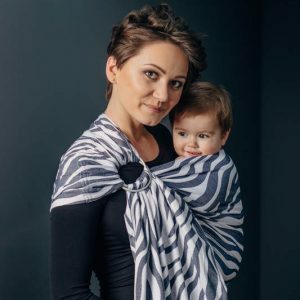 As all Smitten wraps are wide (around 29 or 30 inches after the first wash), this wrap will take you from newborn through toddler (or even preschooler) happily and comfortably. 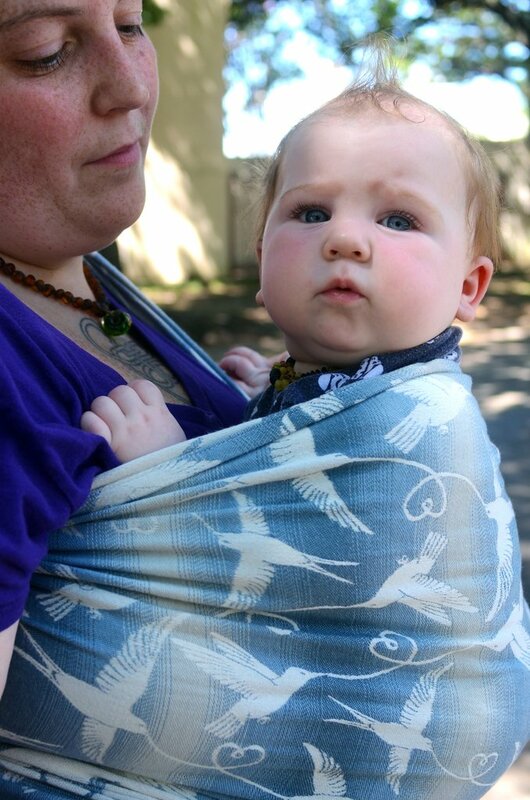 The Nimh Justin wrap is a fantastic buy-one-and-done-baby-carrier. At approximately 260 g/m² pre-wash, Smitten Nimh Justin is a medium-weight wrap. G/m² stands for grams per square meter (sometime shown as gsm), a measurement for fabric weight. 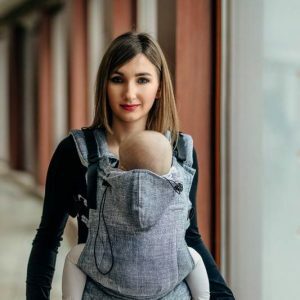 You will be comfortable as this wrap comfortably supports even your heavy baby or toddler! 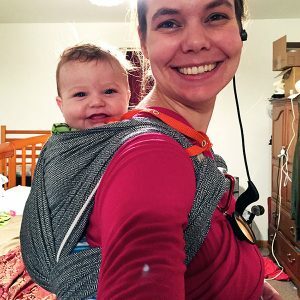 When you get your wrap, try a Front Wrap Cross Carry to learn wrapping. When ready, move on to any of the other wrap carries that you can find tutorials for in my menu. Need help with back carrying or anything else? Email me or post in our wrapping Facebook group, Wrap Club. Smitten with Wovens is a family business based in Texas that produces ethically and responsibly woven wraps made and finished in the USA. Smitten Nimh Justin is packaged in biodegradable packaging and is shipped with a gently used book saved from the landfill. When you are done with the book, Smitten with Wovens recommends donating to your local women’s shelter or mailing it to Books for Africa. Smitten with Wovens donates to a number of charities. A portion of the profits from Smitten Nimh Justin goes to the Physicians Committee for Responsible Medicine. Smitten wraps have passed voluntary ASTM F2907-14b and flammability testing and are lab certified to be free of heavy metals and phthalates and Smitten wraps have a 6 month warranty. Smitten with Woven wraps arrive in loomstate, which means they need to be washed prior to first use. Initial Wash – Machine wash on cold with color safe detergent and tumble dry on low heat. All subsequent washes – Machine wash on gentle cycle in cold water and tumble dry low. Once dry, we recommend steam ironing the wrap to soften it and prevent creasing.